Some fireworks erupted in Game 3 of the Capitals-Hurricanes series. In the Hurricanes' first home game of the postseason, Alex Ovechkin engaged Andrei Svenchnikov, dropping him to the ice after three quick punches to the head. Svechnikov also appeared to hit his head on the ice and was taken off the ice in the altercation. 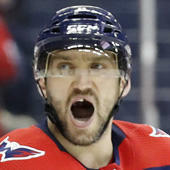 Ovechkin received a five-minute major for the fight, putting the Capitals legend in the box for a solid part of the first period. It was worse from another angle, which ultimately showed Ovechkin following through on Svechnikov and putting his head into the ice. Svechnikov is just 19 years old, 14 years younger than the 33-year-old Ovechkin. He's also been a key part of the Hurricane forecheck this postseason, notching three points -- including two goals -- in the early going. The play could end up having a serious effect on this series, especially if Svechnikov ends up missing time with a head injury. Ovechkin has been antagonized by the Hurricanes all series, so it appears that falling behind early in this game mixed with something Svechnikov said was enough to tip him this time around.